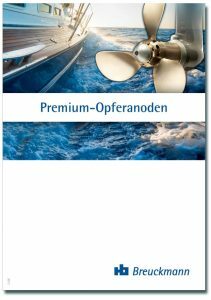 Corrosion protection for ships and their component parts. You cannot find a suitable anode in our online shop? No problem! We also manufacture customised anodes based on customer sketches. Do not hesitate to contact us. In order to provide effective protection against corrosion, we manufacture premium sacrificial anodes from highly pure zinc and a high-quality aluminium-indium-alloy. If corrosion causes irreparable damage to component parts such as corrugate or the ship’s propellers, the material and economic damages caused can quickly become very substantial. By using cathodic corrosion protection, it is possible to control the process intelligently and thus to sensibly protect structural elements of the ship in a targeted manner. Here the metallic component that is to be protected is connected conductively with a base metal from the elements in the electromotive series, namely the sacrificial anode. The current flows in the direction of the metal that is to be protected. The base metal then releases its electrons in lieu of the ship’s component that is to be protected, and the base metal is corroded and dissolves. The anode “sacrifices” itself for the benefit of the metal that is to be protected, hence the name “sacrificial anode”. Only by using high-quality raw materials can we achieve a high level of efficiency. Unfortunately, some manufacturers’ raw materials contain highly toxic substances such as lead and cadium in alarming quantities. This not only results in markedly less protection but also places an enormous burden on the environment. Breuckmann supplies anodes made of highly pure zinc (Zn99,995) and a highly pure aluminium-indium-alloy (AlZn5In) made at our own production facilities in Germany.